Realtor.com published an article about the 10 biggest comeback cities in the U.S., and Reno comes in at #10. It appears they have done their research, except for one thing, and that is what they say about Reno. I guess it only sells or is interesting if they put exaggerations into their stories. I can’t say what they say below is untruthful, but it is how they say and present it. My comments are below in orange. I am proud of our Rno, but this article isn’t portraying the “Bigges Little City” correctly. The recession walloped Reno’s gambling industry, leaving the city with empty casinos and scores of vacant, bank-owned homes. More than 40% of local homes were foreclosed on in 2009, and hundreds of homeless people set up an encampment downtown. The recession did wallop our gambling industry and cause mass-foreclosures. But the homeless thing? It sounds like we had homeless people all over the downtown area in tents, 55 gallon drums with blazing fires, and no one doing anything about it. It couldn’t be further from the truth. Sure, we have homeless just like any other city, and we have homeless shelters to help those that need a safe and warm place to stay. Those people are not the same as the people who lost their homes to foreclosure. They didn’t become homeless, or at least 99.5% of them didn’t. They were just caught in bad circumstances from either bad timing on buying or loss of job(s) from the recession. The free fall of home prices didn’t stop until 2011. By then, many homes had lost half the value they had in 2005. “The recession made people aware that we need a diversified economy. Relying entirely on the gambling and tourism industry is not a durable strategy,” says Mehmet Serkan Tosun, an economics professor at the University of Nevada-Reno. I don’t think so. For as long as I can remember, in 50 years of living in Reno (all my life), we have been aware that we need to diversify. We have constantly been moving in that direction, and it is getting better every year. The new strategy? Making Reno a haven for doing business: offering cheap real estate, virtually no corporate taxes and no personal income taxes, and investing in higher education to supply more skilled workers. None of this is new. The comments on taxes and education are true, but cheap real estate? I don’t know what that means. Who offers cheap real estate and how is that a strategy? Reno has since scored big names like Tesla, Apple and the data security company Switch. 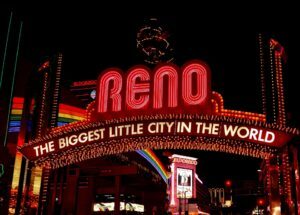 It’s true, and I couldn’t be prouder of my “Biggest Little City in the World.” It does seem like the stars are aligning for Reno to move to the next level, and yes, be more diversified! And those casinos? They’re filling up again. Put your chips on black. Trust us. You might want to place your money on a game with better odds, like Blackjack, but to each their own. And there are plenty to go around. Rocky. Steve Jobs. The Chicago Cubs. Jesus. Lil Bub (Google her!). And, with apologies to Jesus, perhaps the most impressive comeback of all, the one that hits us exactly where we live: the housing industry. But wait, there’s a twist to this tale: The path to housing recovery has not run smoothly across the United States. Some cities have rebuilt and recovered. Some are back even stronger than they were in their heady, pre-crash salad days. And yet others continue to flounder, plagued by swaths of bank-owned homes. So the data team at realtor.com® decided to figure out which parts of the country have recovered the best from the housing bust: the true comeback kids! We took the150 biggest metros around the country, factored in their highest, pre-recession home-price heights, their lowest lows of the crash—and which ones rebounded best through 2016. We measured the recovery by measuring home prices, the amount of new home construction, foreclosure and unemployment rates and the household income of local residents in 2016. To ensure a fair comparison, we excluded markets that didn’t experience much hardship. After all, to compare the recovery in Austin, TX (which barely had a blip), with Las Vegas (famously choked by foreclosures), would be comparing apples to oranges—or maybe Craisins. So what did we find? The cities that achieved some of the speediest and most definitive recoveries have been the knowledge hubs—places clogged with colleges, research centers and young brainiacs, where a nimble, educated workforce helped attract new businesses. And cities that have done a good job diversifying their economy have also been big real estate winners in the past decade. Ready? Let’s go back to the future and celebrate some of the best comeback stories around. California experienced one of the nation’s worst foreclosure crises after consecutive years of skyrocketing home prices, greedy speculation, and go-go building frenzy. Silicon Valley, up north, fared better than Southern California, but home prices still tumbled 24% from their peak, more than the national average of 18%. And as layoffs piled up in the San Jose metro starting in 2008, the unemployment rate shot up from 6.1% to 11% in just one year (2008 to 2009). It was a lousy year. But Silicon Valley was among the first to shake off the economic malaise, fueled by a new and even more frenetic tech boom. High-profile IPOs like those of Tesla (2010) and Facebook (2012) increased morale as venture capital money poured in—and new startups just kept popping up. For each new software company, the city needed more engineers, more designers, more receptionists, more cleaners, More of everything. So the job market heated up faster than a circa 2005 PowerBook. In the post-recession era, the San Jose metro holds tightly on to its position as one of the hottest housing markets in the country. Foreclosures are virtually nonexistent—less than 1% of homes filed last year. And new home construction has also picked up ahead of the country. As in San Jose, the housing collapse magnified the recession in the San Francisco metro, because prices were unreasonably inflated in the bubble. This was one big bubble! At the lowest point, in 2011, home prices slipped to $493,100, down 30% from the peak in 2007. The job market cratered, with the unemployment rate surging to 9.9% in 2010, slightly worse than the atrocious national average of 9.6%. Macy’s eliminated its 1,400-person Macy’s West division in San Francisco, the San Francisco Chronicle newspaper almost went bankrupt, and hundreds of stores and restaurants shuttered their doors. However, young techies tried to embrace the situation with humor. “Funemployment” became a common buzzword, as they used their jobless time to travel, enjoy long, boozy lunches, and chill with friends. They knew the tech business wasn’t vanishing, even if their current jobs had. The optimism kept talent from leaving San Francisco, which helped speed up the tech biz recovery. Now-successful companies like Uber and Pinterest were founded during the worst time, and startup ideas were bubbling up all over. The local powerhouses Twitter and Yelp went public in 2012, helping to accelerate the growth. Back in the 2004-07 housing run-up, Portland’s Kruse Way was known as “Mortgage Row,” because it was packed with real estate companies and mortgage firms. After the crash, many of those companies closed up shop, and the same street was dotted with ads for cheap office space. Indications of the depression ranged from foreclosed signs outside suburban homes to empty storefronts on the famous 23rd Avenue shopping strip. In 2009, the city had a scary-high unemployment rate of 10.9%. A deepwater port on the Columbia River, Portland’s economy relied largely on global trade. But the crash hit those businesses hard. Trade was squeezed, stevedores and warehouse workers were out of jobs, and manufacturing slowed to a crawl. The good news was that people never stopped moving here. Since the 1990s, people had been lured by the city’s tolerant, offbeat, bicycle-powered lifestyle, and the great outdoors. That population growth kept the local economy afloat. And then high-tech companies spearheaded the recovery. Young firms like Puppet Labs and Jama Software grew rapidly after the recession. Portland’s own homegrown corporate powers, like Nike and Columbia Sportswear, regained strength, while maintaining competitive wages. In 2017, the Portland metro has the nation’s fastest-growing economy, according to the real estate firm HFF. This manufacturing hub long touted its nickname of “Furniture City,” for making fine office desks and other furniture. But who the heck needs office desks when the country is in a deep recession? Thousands of gigs were moved overseas. Big companies like Herman Miller announced major layoffs, smaller ones like Klingman’s closed doors under towering debt. In 2009, 1 in 9 workers in Grand Rapids was out of a job. But the city snapped back, with a newfound emphasis on the health care industry. The world-class oncology research center the Van Andel Institute and Michigan State University’s brand-new biomedical research center led the charge. Manufacturing expanded beyond furniture making to medical devices, aerospace and defense, and information technology. “When you don’t put all your eggs in one basket, you recover a lot faster,” says Tim Mroz, vice president of the Right Place, which helps local business development. Since 2011, housing prices have been booming, with 5% growth each year. Brigham Young University largely shielded Provo, just outside Salt Lake City, from disastrous unemployment during the recession, but it couldn’t save the real estate market. It only took two years (from 2007 to 2009) for home prices to crash 26% from their peak to the bottom. A sharp decline in construction also left the housing market lifeless. But things turned around quickly. As early as 2010, cranes were back at work on a new convention center downtown, and then on the expansion of the headquarters of NuSkin, the maker of dietary supplements. The sound of trucks and jackhammers resurfaced in the suburbs as well, signaling more single-family homes, as well as a job revival in the construction industry. The low cost of living and affordable homes also encouraged millennials into homeownership. 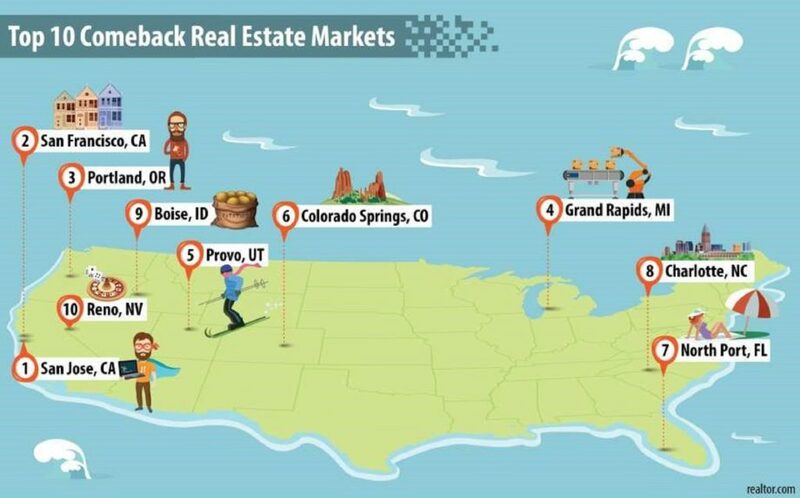 In 2015, Provo was one of the top markets for first-time buyers to take out a mortgage. In the recent recession, Colorado Springs got a new motto: “Do-it-yourself government.” Volunteers could adopt a street light, because one-third of the city’s street lights were turned off to save money, or adopt a trash can so that the city could afford to collect trash from parks. As city mottos go, this one left something to be desired. Household income in Colorado Springs shrank to $51,700 at the bottom of the recession, $7,200 less than at its highest point, in 2008. But proximity helped. Just an hour south of recession-proof Denver, and shielded from the downturn by a booming energy sector, Colorado Springs boasted homes about one-third cheaper, making it a great deal for commuters. New home construction is now booming, especially in the northern part of town. “We were languishing behind the rest of Colorado, but that’s really reversed in the last several years,” says Daphne Greenwood, an economics professor at the University of Colorado-Colorado Springs. Southern Florida was the poster child of the subprime mortgage crisis. The skyrocketing prices in the early 2000s housing run-up were fueled by debt and starry-eyed investors, rather than those who could actually afford the homes. Then prices crashed fast and hard. Among the hardest-hit was the North Port-Sarasota metro area, a collection of mostly retirement communities an hour south of Tampa. Home values vaporized by 40% from 2006 to 2011, as many potential buyers’ savings and retirement funds took a hit. At the very worst point, 1 in 4 homes filed for foreclosure. From there, a hard slog back began. Unlike sprawling Tampa, the North Port metro consists of smaller, more friendly communities for retirees. Sarasota and Venice, with vibrant cultural arts scenes, white-sand beaches, and historical downtowns, are famous for well-heeled residents. Since the market bottomed out in 2011, home prices have recorded an 8% annual price growth. America’s financial hub was also at the center of an economic slowdown in the recession. From Wells Fargo to BB&T, Charlotte’s financial world was struck by massive layoffs. The unemployment rate swelled to a whopping 12% in 2009. The road to recovery started with an expanding local economy—extending beyond the financial sector. The city has won thousands of jobs by persuading companies to relocate with the promise of tax breaks. The home-appliance manufacturer Electrolux moved in its North American headquarters, and the insurance company MetLife put its retail business in Charlotte. Business and population expansion jump-started the stalled construction industry. Condos and apartments sprouted in and around downtown, including luxury buildings with pet- washing stations and HGTV-inspired kitchens. And home prices came back. At the lowest point of the Great Recession, virtually the only sector in Boise that was holding on was the government. Barely. The semiconductor producer Micron Technology, once Idaho’s largest private employer, slashed 2,000 jobs. Years of overbuilding in the suburbs resulted in more homes for sale than buyers—causing home prices to fall 35%. To pull itself out of the downturn, Boise poached from the tech industry to diversify its economy, marketing itself as an affordable launching pad for startups. Today, the Boise Valley is home to more than 400 tech companies, from Hewlett-Packard to startups like GenZ, which develops agricultural technology. As the economy turned around, house prices have marked a five-year streak of steady growth since 2011. The recession walloped Reno’s gambling industry, leaving the city with empty casinos and scores of vacant, bank-owned homes. More than 40% of local homes were foreclosed on in 2009, and hundreds of homeless people set up an encampment downtown. The free fall of home prices didn’t stop until 2011. By then, many homes had lost half the value they had in 2005. “The recession made people aware that we need a diversified economy. Relying entirely on the gambling and tourism industry is not a durable strategy,” says Mehmet Serkan Tosun, an economics professor at the University of Nevada-Reno. The new strategy? Making Reno a haven for doing business: offering cheap real estate, virtually no corporate taxes and no personal income taxes, and investing in higher education to supply more skilled workers. Reno has since scored big names like Tesla, Apple and the data security company Switch. And those casinos? They’re filling up again. Put your chips on black. Trust us. * For each metric, we ruled out the metros that ranked in the top 20% of performers. Metrics include housing prices, new construction, foreclosure rate, unemployment rate, and household income. All annual numbers cited in the article are the median of 12-month data, to even out seasonality. Data source: realtor.com®, U.S. Census Bureau, Moody’s Analytics, U.S. Bureau of Labor Statistics. This article “These Cities Are the 10 Biggest Comeback Stories in U.S. Real Estate” appeared on Real Estate News and Advice from realtor.com.